Baker Perkins exhibited three bakery forming machines with new cost-saving and efficiency features at IBA (Hall A6 Stand A6.155). Baker Perkins launched an upgraded and extended range of Accurist™ dough dividers. Now known as the Accurist2.1™, the new range is a development of the Accurist2™ and retains all the features that enabled the original machines to offer a unique combination of sustained scaling accuracy and gentle dough handling. 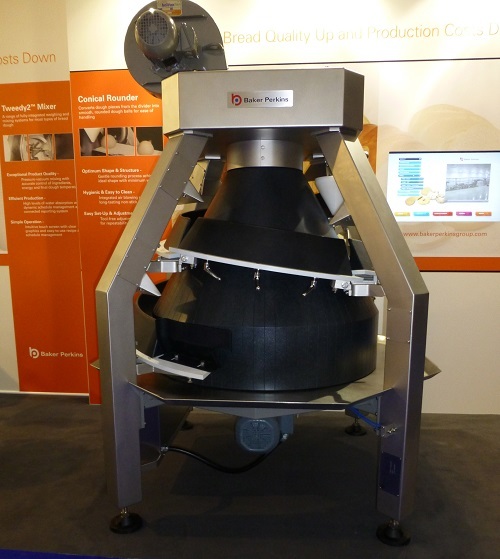 The new Intelligent Dough Weight Control system reduces the average dough piece scaling weight by adjusting the divider in real time to compensate for changes in dough density. The system reacts to the gradual changes that occur over the life of a batch as well as the sudden changes that occur when a new mix is dropped into the divider. Working in conjunction with feedback from the checkweigher, the system maintains dough piece weights within tighter limits reducing giveaway and enabling the target weight to be reduced. The Accurist2.1™ also includes a new oiling system with improved performance. An upgraded filtration system keeps the circulating oil clean while a new pumping and dosing arrangement ensures it is delivered accurately and consistently. Improved oil pathways in the ram provide reliable distribution enabling the divider to run for extended periods. Maximum output has been raised from 9,000 to 10,800 pieces per hour. Plants up to this capacity can now run with one divider, rounder and intermediate proofer instead of two. Additional improvements include a new lightweight die which reduces running costs by extending the cleaning interval, reducing oil consumption and having a longer life. The gentle sheeting action and tight coiling of the sheeting head result in a 10% increase in volume and cell count, which give an improved crumb structure and better colour. An increase in softness of up to 18% leads to a longer shelf life. As well as improving all types of tin bread for the retail market, it also helps meet the exacting standards for loaf shape and crumb structure of sandwich bread producers, and deals reliably with a variety of products such as fruited, soft brioche and heavily seeded dough. The Baker Perkins conical rounder combines efficiency with hygiene. Several features help eliminate inconsistent piece weight and waste, and minimize cleaning time, by preventing dough adhering to surfaces. All dough contact parts have heavy-duty non-stick coatings, troughs are mounted on low-friction polymer bases, and there is a fully-integrated air blowing system. Adjustments are calibrated for easy product change, and set-up is repeatable. The conical rounder accepts divided dough pieces and forms them into ball shapes. It is a fully integrated part of a Baker Perkins forming system.